This 42-foot Bertram out of Flamingo, repowered by twin Cummins QSM-11 four-stroke engines, boasts one of the area’s top American captains. Her new interior is fully air conditioned and has a TV/VCR, and a head with shower. The all-new equipment includes a fighting chair with a 4-rod rocket launcher, live well, Penn, Shimano and Fisherman’s center rods and reels, Penn downrigger and Rupp outriggers. Three VHF radios, two GPS, two depth sounders and 72-mile radar, plus all required safety gear, complement the state-of-the-art equipment. 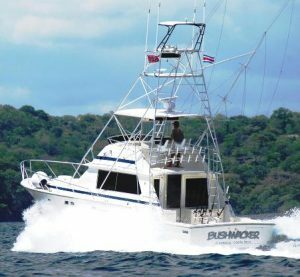 The captain will also go to Tamarindo, Papagayo Nosara and Samara/Guanamar/Carillo for multiple days.